This was the third Monsters of Rock festival, and the second time I went to the event. I drove down with my mate Dave, and we had a great time. 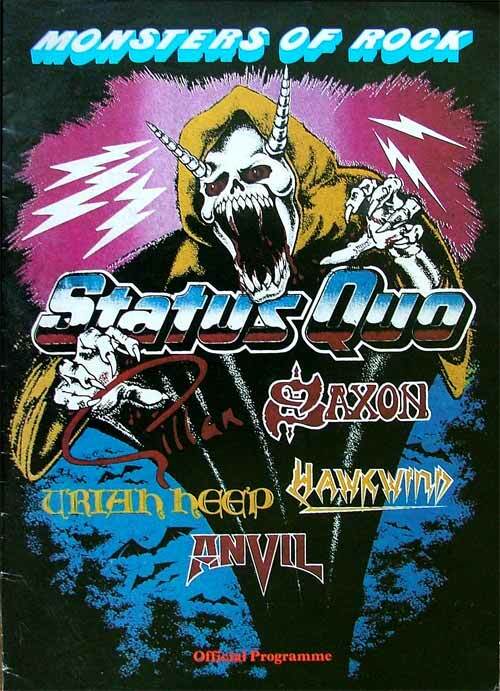 It was a strong line-up of hard rock bands with Status Quo topping the bill, and a clutch of great support acts in Gillan, Saxon, Hawkwind, Uriah Heep and Anvil. Tommy Vance was DJ and compere for the day. Highlights for me were Hawkwind, Uriah Heep and Quo. Saxon were quite successful at the time and represented the NWOBHM, and Gillan seemed to gig constantly during that period, and was always good fun, playing a few Purple classics alongside his own material. Uriah Heep were fronted by new(ish) singer Pete Goalby, alongside long time Heepsters Mick Box, and Lee Kerslake. Their set included classic tracks like Stealin’, The Wizard, July Morning, Gypsy and Easy Livin’. It seemed strange to me to see them so low down on the bill. Both Heep and Hawkwind would have had headline status a few years earlier. Hawkwind’s set feautured Brainstorm, Angels of Death, Urban Guerilla, Psychedelic Warlords, and of course Silver Machine and Master Of the Universe. Their ever-changing line-up at this time included Dave Brock, Huw Lloyd Langton, Harvey Bainbridge and Nik Turner. Both great bands. But the day rightly belonged to Quo, who were worthy headliners. We pushed our way right down the front for their set. 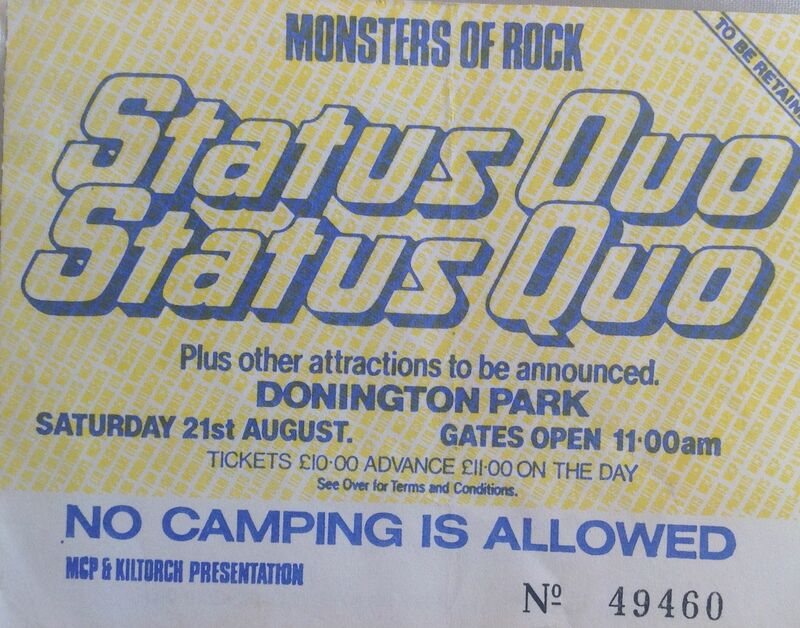 This show is often rated as not one of Quo’s best, but I enjoyed seeing them headlining a festival again, and thought they were pretty good. There were some problems with the sounds, with some parts of the crowd reporting that they couldn’t hear Quo very well, but I think this depended on where you were placed in the field. This was the first time I saw the band with Pete Kircher who replaced John Coughlan on drums. Quo were celebrating their 20th anniversary as a band. Status Quo setlist: Caroline; Roll Over Lay Down; Backwater; Little Lady; Don´t Drive My Car; Whatever You Want; Hold You Back; Rockin All Over The World; Over The Edge; What You´re Proposing; Dirty Water; 4500 Times; Big Fat Mama; Don´t Waste My Time; Roadhouse Blues; Rain; Down Down; Bye Bye Johnny.